Nathan and I met 5 years ago in our hometown of Bunbury, WA. At that point he was a chef and I was studying nursing whilst working two part-time jobs to fund my profound traveling addiction.I was waitressing at a restaurant he had previously worked at, and he asked the chef, his friend, for my number. I nearly said no! From the start it was always something special – We booked a trip to Europe within 6 months of knowing each other, and very nearly got engaged in Paris on Valentines Day but decided to show restraint! From there we moved to Perth to chase our careers, both studied further and are now working our dream jobs, in our own house, with our mini Dachshund who is our child. Anybody who knows us is witness to the love we have for our sausage dog who has a blatant but very cute disregard for personal space. We are both stubborn and strong-willed, but what makes us work is how crazy we are about each other. We’re that irritating couple who are honestly sad when faced with spending a night apart. We share a love of good food and even better drink, and are not known to pass up life’s small luxuries (hello cheese, gin and coffee). When we first met, Nathan worked up north in the mines for weeks on end at a time. That particular job didn’t last long as we quickly became infatuated with each other. I (Sarah) now do shift work as a registered nurse in Intensive Care whilst continuing post-graduate study. Nathan works a more traditional 9-5 as a mechanical draftsman but logs many an extra hour as he is dedicated and passionate about his career. Naturally, our hours are not always relationship friendly, and sometimes we just have to wave forlornly at each other at 10.30pm as one gets home and the other goes to bed. But we make it work! Our style and theme was simply ‘us’. The initial process of planning our wedding was a whirlwind chain of events. We always wanted to keep it quite simple, with the emphasis on a beautiful location, our closest family and friends and good food and wine. We quickly picked out the perfect venue that we were in love with in the Swan Valley, promptly paid the deposit and started planning the 70 guest wedding we thought we wanted. Months went by and the prospect of organising the wedding seemed less and less enjoyable. We procrastinated, became indecisive, deemed everything too expensive and started to jokingly dream about eloping. 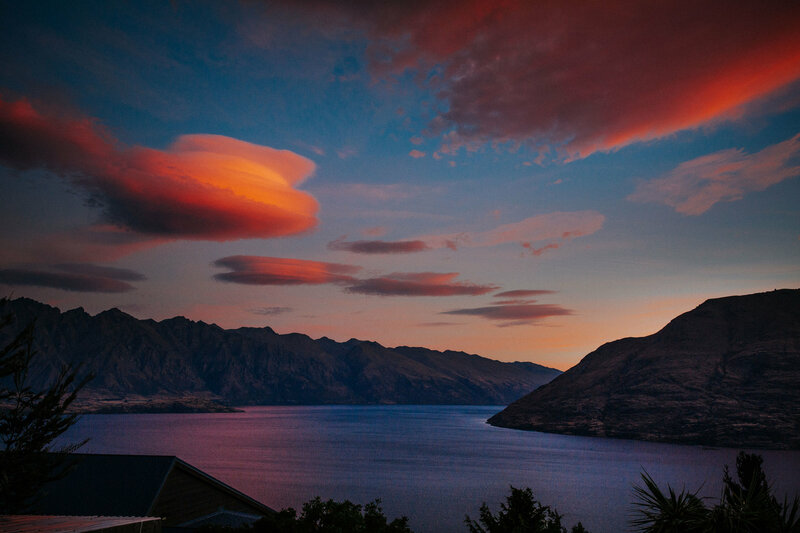 We had been to New Zealand the year before and fell head over heels in love with the South Island, and slowly the thought of each other, a mountain in Queenstown and a couple of rings crept into our minds. We finally sat down with a bottle of red and did a lot of back-and-forward “I want to elope, but I know you wont” banter. The more red we had, the easier it was to admit that neither of us needed nor wanted a wedding to express how much we loved each other, and it simply wasn’t us. After that night, we quietly cancelled our venue, booked some flights, and set about planning. We knew we had done the right thing when I emailed my dream Perth-based photographer, Kate Drennan, and told her about our plans to elope. 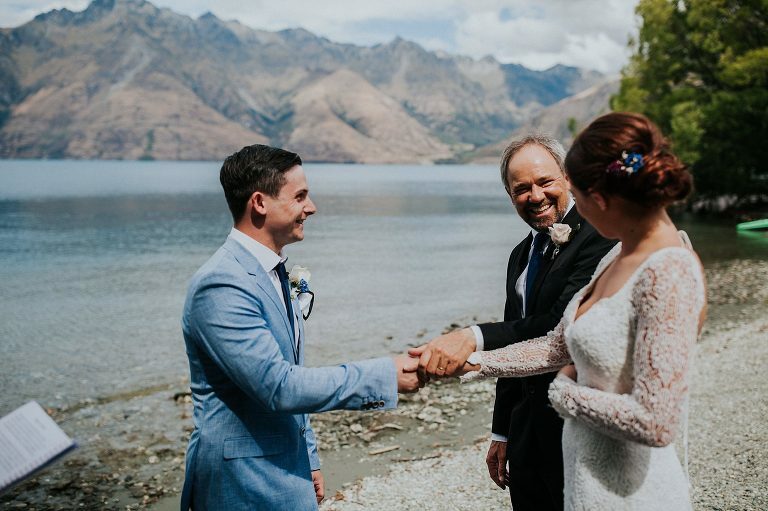 Stars aligned perfectly as she, in some fantastic twist of fate, was already going to be in Queenstown shooting another wedding on the week we planned to get married. Four months later in January, we flew to New Zealand, meeting my parents and Nathan’s brother and his wife. We had a marriage license but, in true ‘us’ style, arrived not knowing where we were actually going to be married. The day before our wedding we drove all around Lake Wakatipu before stumbling across a beautiful stretch of the shore called 12 Mile Delta, which was framed by the Remarkables in the background. Everything was so relaxed, which was exactly how we envisioned it. On the morning of the wedding we woke up together, wandered to a café and enjoyed brunch and a good coffee as we would normally do. My bouquet, by the amazingly talented florist Gypsy West, was utterly perfect. 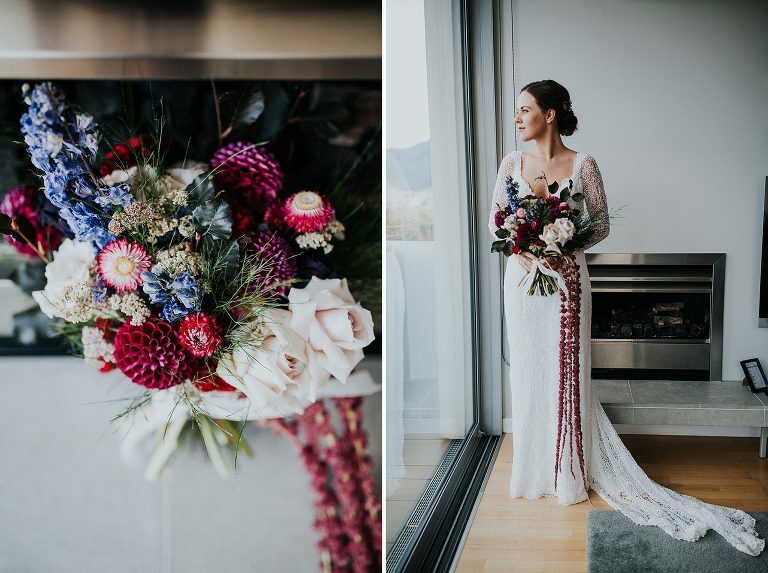 I had described something like, “Moody blush tones, with a long dangly feature”, and she took that vague vision and delivered whimsical flowers that suited the romantic style of our elopement so perfectly. We exchanged vows on the shores of the quiet lake with mountains behind us and four of our favourite people in the world to witness. It was peaceful and encapsulated in a staggeringly beautiful and pristine place, and true to us. Neither of us wanted a tailored tuxedo or an elaborately fitted wedding dress, so we each chose something that perfectly captured how we wanted our day to be – relaxed. 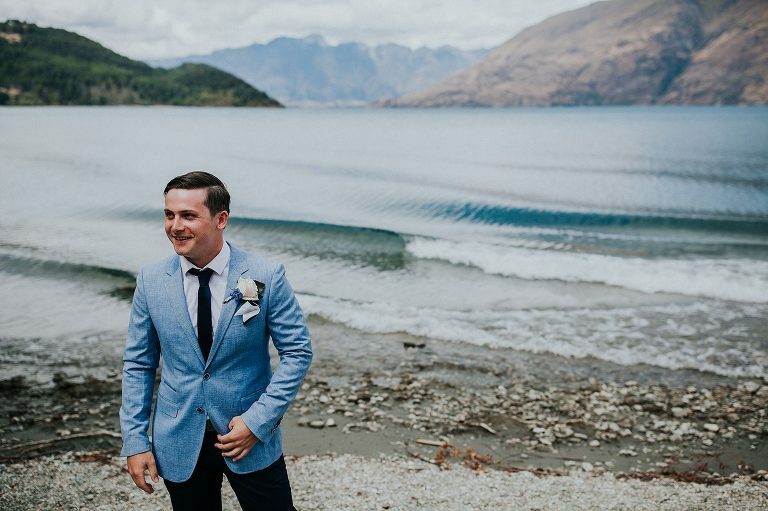 Nathan had a light blue suit jacket from Politix and I chose the boho and whimsical Teresa gown from local Perth designer Q’nique. Nathan bought me beautifully classic diamond earrings, and I gifted him an antique-style pocket watch. For me (Nathan), the most memorable, but very cliché moment was watching Sarah walk down our ‘aisle’. I always knew it was going to be a pretty special thing to see, but when it’s your soulmate on their way to spend the rest of their lives with you, that’s extra special. Its like a feeling of complete contentment, that we had both found each other and everything was going to be perfect. Naturally, there were a few hiccups. We hadn’t quite discussed whose job it was to manage the rings, so we weren’t overly surprised when Nathan’s brother froze in fear when it was time to hand them over before hastily running to his car. It gave us all a few minutes to laugh nervously, and more importantly a chance to breathe and sneak a quick kiss. Before we knew it, Lily was diving into the lake to rescue the champagne cork for us after we had recited our own simple vows that we had written together. After our ceremony, we piled into the car and took a selfie as husband and wife before heading off for photos. Photos were always a high priority for us, as very few people were there to witness the magic in person. We soon found ourselves ecstatically teetering on the edge of 100m high cliffs on the stunning Coronet Peak, pinching ourselves over how breathtaking the moment was. Later we had an intimate dinner at Eichardts Hotel on the lakefront and watched the sunset over the mountains with champagne in hand. We kept it real by trekking through the town later, complete with our leftover wedding cake, and piling into a maxi taxi home. We had already decided that a two-day wedding was in order, and the next day slipped back into our wedding attire and piled into a helicopter with Kate. We headed up to the moody, mysterious and staggerly beautiful Earnslaw Burn in the Remarkables. We nearly didn’t make it – the weather report showed rain for most of the morning, but Kate pulled some bargaining strings with the weather gods and we risked the weather to show our adventurous natures and our blatant disregard for the colour white – I’m still picking miscellaneous flora out of my lace, and my heels will never quite be the same. We literally chased glacial waterfalls and counted our blessings. Keep surprising each other, whether it’s chocolate tucked away in the fridge, or spontaneous flights to your favorite place in the world. Always appreciate the small things. But most of all, cancel the wedding, run away, and do whatever you want to do to celebrate that crazy special feeling of love.